As a medical scientist, I believe in well-controlled, randomized clinical trials—yet I’m sharing with you a “study” involving a single subject. He’s someone I’ve known for a long time, and he’s given me excellent data. Although my friend—we’ll call him Tom—doesn’t have diabetes or prediabetes, I believe that many people who do, and are overweight, may have sleep apnea— and could benefit from his experience. Tom’s wife had complained about his snoring for years, but when she noticed that he sometimes stopped breathing for prolonged periods and gasped for breath, she began worrying that he might have sleep apnea. When she finally moved to a separate bedroom to get a good night’s sleep, Tom decided it was time to have a sleep study. The diagnosis: mixed sleep apnea, a combination of obstructive and central apnea. The treatment: a continuous positive airway pressure (CPAP) device, a mask Tom straps over his nose and mouth at bedtime. A small machine connected to the mask pumps air through the mask to keep his airway open while he sleeps. No more snoring or sleep apnea. Before the sleep study, Tom had been struggling with a weight problem. Despite working out at a health club three times a week, and avoiding overeating, he was gaining weight. He recorded his weight under identical conditions each time he was at the health club. His data are shown in the chart below. Everything began to change once Tom began using the CPAP. His weight dropped steadily and dramatically, from a high of 162 to 135 pounds, according to his most recent report. Some sleep experts believe that lack of “good” sleep leads to higher levels of the hormone ghrelin, which spikes the appetite, and lower levels of the hormone leptin, associated with feelings of fullness. The action of these hormones could explain why some people, like Tom, who aren’t getting decent sleep—because of sleep apnea or other causes—gain weight. But wait—the story isn’t that simple. According to an archive article in WebMD, a physician who specializes in treating sleep disorders has found that his overweight patients with sleep apnea don’t have the typical low leptin levels—in fact, their leptin levels are uncharacteristically high. And when apnea is treated, the leptin levels drop—but somehow that helps patients lose weight. So, it’s possible that individual responses to leptin may vary. Clearly, more studies are needed. For some time now, researchers have suspected a link between sleep apnea and diabetes. A report published online June 6, 2014 in the American Journal of Respiratory and Critical Care Medicine lends some strength to that theory. The study analyzed data from 8,678 nondiabetic adults who underwent a sleep study. During follow-up, patients with severe obstructive sleep apnea (OSA) had a 30% or higher increased risk of developing diabetes than patients without OSA. Mild and moderate OSA carried a 23% higher risk. Another study, published in the New England Journal of Medicine, showed that the changes in hormone levels were still present after 1 year. A recent review article, published in Chest, explores in greater depth the association between obstructive sleep apnea and diabetes. Bottom line: If you or your partner think you might have a sleep problem, talk with your doctor. If you’re one of the many people who’ve been diagnosed with sleep apnea, and have tried a CPAP, but couldn’t tolerate it, why not give it another try. 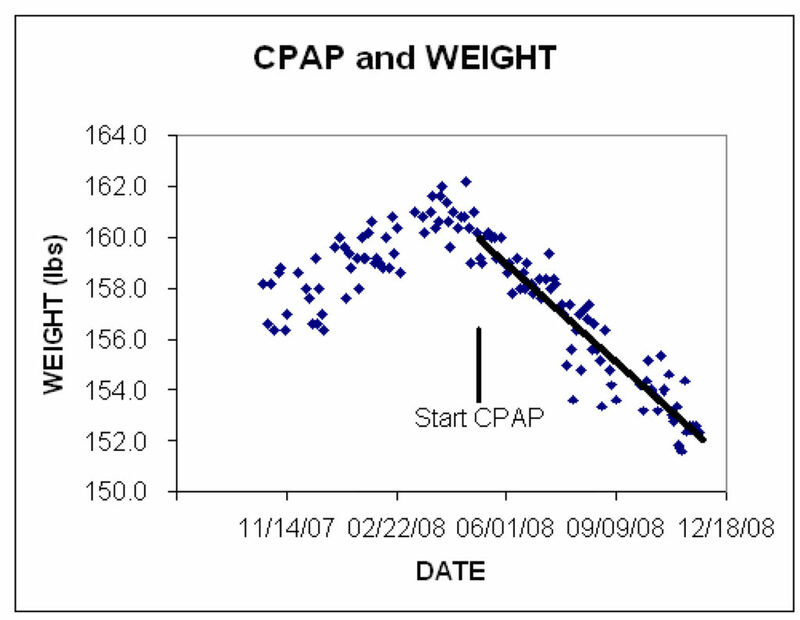 Newer CPAPs are smaller, lighter, and more user-friendly. Some models come without straps and heavy head-gear, and many are battery operated. Tom’s experience with weight loss won’t work for everyone, but controlling sleep apnea could make a huge difference in your diabetes control, and your life. By the way, Tom’s wife has moved back into their bedroom.